People think our lunches are often fancy and creative, and maybe they are, but I assure you they’re not a lot of work. If you look closely, as some longtime readers already have, you’ll notice that we’re really just doing variations on the same themes over and over — and when it comes to things like sides, I’m not reinventing any wheels. One kid likes clementines and applesauce cups and by golly, he’ll have one or the other — or both — most days of the week. One kid really likes bell pepper strips and berries, and those are going to turn up in his lunchbox more days than not. Variety is great for nutrition and habit formation, but TOO much variety can end up being more work, more expense, and more stress when things come home uneaten. 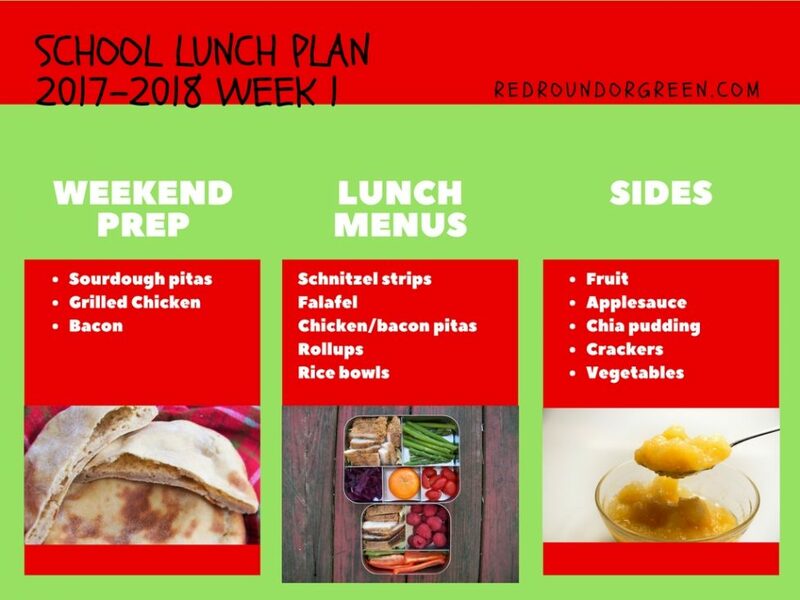 So here’s a glimpse into my lunch-packing brain — Week One of the school year (technically, we’ve already had a few days of classes, but this is our first full week back). Tuesday Night: I’ll set aside some extra chicken breasts and bacon strips while I’m making the Cobb casseroles. I’ll grill the chicken, cook the bacon, and store in the fridge for Wednesday morning. Your lunches always look great. But I’m wondering – do your kids eat the leftovers cold? Mine are picky about temperature! Yes, mine will eat most things room temperature. Sometimes you’ll see I send a thermos, which keeps stuff warm enough for them!